An important nerve runs through the narrow tunnel on the inside of the elbow and is responsible for possible sensory disturbances in the ring and little finger, called the ulnar nerve. This condition is also called irritated elbow nerve. In an advanced stage it can also cause major loss of strength and function of the hand (intrinsic hand muscles). Often the complaints are position-related due to prolonged folding (hyperflexion) of the elbow in a sleeping position. Initial conservative treatment will take this into account. A splint is made to be worn at night and prevent prolonged folding of the elbow, combined with physiotherapy for ulnar nerve gliding techniques. 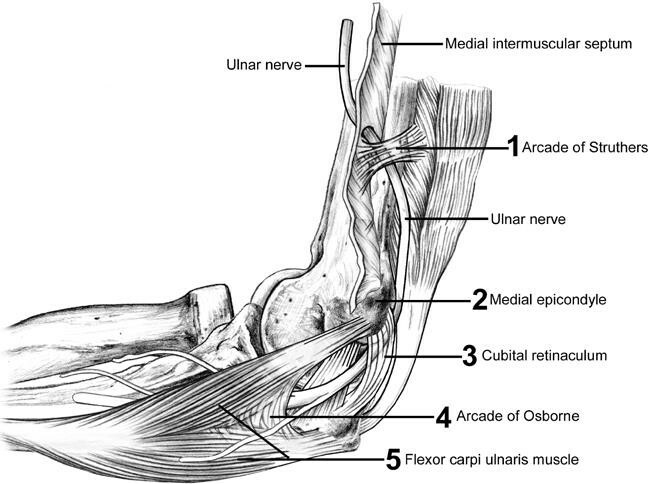 If there is not enough improvement or a progressive loss of strength the ulnar nerve can be released in its tunnel. Either the nerve is simply released (ulnar nerve release without transposition). Or, if there is a risk the nerve will move forwards, an anterior transposition is performed. The ulnar nerve is usually positioned under the group of flexor muscles for protection (ulnar nerve release with anterior submuscular transposition). This procedure can be performed under loco-regional local anaesthetic in the outpatient clinic. After surgery an immobilising bandage lined with wadding is fitted, and worn for two weeks. Afterwards the patient starts rehabilitation. In a case of advanced entrapment with pre-surgical loss of strength, physiotherapy is incorporated immediately and specifically focuses on regaining the function of the hand.